Just before New Year I bought the new Revell Mustang kit. I missed it first time round as it quickly sold out here in Stockholm. 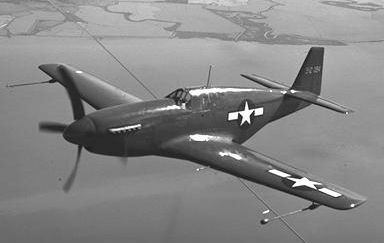 Revell's choice of P-51B, the first Merlin-powered version of the Mustang, is interesting. 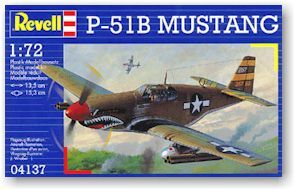 It offers a welcome change from the plethora of P-51D kit available on the market. Curiously, the first comments and reviews about this kit found on the World Wide Web and in the magazines created an air of controversy. Many have praised the kit for it's crisp detail and acurate "B" wing, while others stated that it looked "nothing like the Mustang". Thinking that nothing is better than forming one's own opinion, I have compared it to photographs and the Hasegawa kit to see how good it really is. My findings are described below. Words good or bad are used here is in the sense of how accurate is the outline, etc. I have not considered details, neither internal nor external, which by the way make a favourable first impression. Accuracy for me is outline accuracy, in other words how well does the kit portray the outline of the real thing. It is not about detailing, panel lines, or how well the kit builds. Before I make any statements about the kit, I'd like to make a few remarks. For the first, all views are my personal opinions. Opinions are based on the study of numerous photos, not on plans. Plans and drawings are only referred to if they make things clearer. Finally, the described differences between the kits are usually small and subtle, please read it as such, even if the impression in certain places may be of vast differences. First of all the main point of contention when it comes to Mustang kits - the leading edge extension (LEX). Revell botched it! 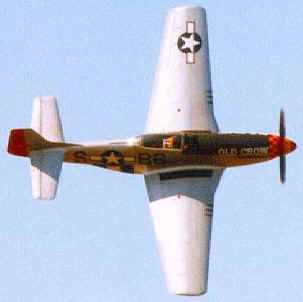 Distinctely larger leading edge extensions of the P-51D can be seen on this photo of the preserved aircraft. I will try to explain what the extension should look like. Look at the upper wing in the kit. There is a square panel just inboard of the gun ports. On a D Mustang the LEX starts just inboard of this panel and is angled forward. On A, B and C Mustangs the LEX starts at a point approximately one half of this square panel further inboard and is angled forward. The Revell LEX starts at the D point and is not angled forward sufficiently. The Hasegawa LEX starts at the A/B/C point but is angled too much forward. The cover photo on the Detail and Scale book on early Mustangs clearly shows what the lex looks like and its size. It is a personal choice whether the Revell or Hasegawa kit better represents the LEX. In spite of its faults, I prefer the Hasegawa. The faulty LEX is a common problem of most Mustang kits. The only decent wing extension I have seen in kit form is on the Accurate Miniatures Mustangs. For those with a good reference library - the Squadron Signal book Mustang in Color shows clearly and correctly the difference in the A/B/C LEX and the D LEX. Unfortunately the drawings in the Detail & Scale are not accurate in this respect). Rest of the wing - both kits are very, very similar, with some subtle difference in the curves of the wing tips. Both are accurate with the exception of the wing tips where neither is spot on, but the Hasegawa appears to be slightly better. 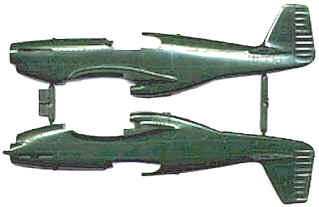 Rear wing (stabilizers) - using the hinge line as a reference - the Hasegawa has more sweep on the leading edge, while the Revell has more sweep on the trailing edge. The Hasegawa matches photos better. Fuselage - the Revell kit is longer than the Hasegawa by 2 to 3 mm, and they differ in the following areas: nose, radiator, fin and rudder. Overall they give slightly different impressions. When seen from the side the Hasegawa better captures the look and feel of a P-51B. Nose - virtually all the difference in length between the kits is in the nose. The Hasegawa may be a tad short but the Revell is too long. A Mustang nose is quite Spitfire-ish; in other words it is round in front of the cockpit changing in profile so it becomes flat just aft of the spinner. Good photos of Mustangs with the panels removed show the frame around the engine, and clearly show squarish frames towards the front. This flattened profile is better captured by the Hasegawa kit. The curve of the underside of the nose, from the wing to the spinner, is different in the two kits. The Hasegawa may be slightly too shallow, while the Revell is too steep. The fuselage sides at the rear of the nose and fuselage, more or less up to the front of the canopy, should be slab-sided. Revell has captured this correctly, while Hasegawa is slightly rounded here. and slightly angled fuselage sides. The intake duct for the radiator, under the wing, is slightly higher/larger on the Revell kit. The Hasegawa is most likely more correct dimensionally, but I prefer the look of the Revell duct. It curves more like on the real thing while the Hasegawa gives a flattened impression to the bottom of the duct. The rear part of the radiator housing, from the duct to where it joins the fuselage just in front of the rear landing gear, differs in the two kits. The Hasegawa has a more continuous curve, which meets the fuselage at a greater angle than on the Revell. Here the Hasegawa is subtly more correct. Also the Hasegawa fuselage sides are flatter here, which I feel is correct. Taken as a whole - both the duct and rear part - I feel that the Hasegawa better captures the look and feel of this area. Fin and rudder - this was a difficult one. The two are virtually the same shape, but the Revell is slightly larger overall. They differ slightly in two places, the angle between the leading edge and top of fin, and the curvature of the lower trailing edge of the rudder. Overall the Revell gives a better impression, while Hasegawa may be more correct in the two places they differ. The curvature of the spine, the angle at which it meets the fin and the overall depth of the rear fuselage - including the radiator housing - is very characteristic on the Mustang. Overall the Hasegawa is better; it also has a 'chunkier' appearance here, as does the real thing. But the fin and rudder do detract from the overall impression. Propeller and spinner. The Revell spinner is slightly more rounded than the Hasegawa, and is better. The Hasegawa propeller blades are slightly longer than the Revell ones, and both the cuff and blades themselves are straighter (the Revell cuff flares at the root and the blades have a more pronounced curve on both leading and trailing edge). Slight edge here for the Hasegawa blades. Canopy - this has been critisised elsewhere. Unfortunately I can't fairly comment on this as my Revell kit has the standard canopy and my Hasegawa the Malcolm hood. The rear fuselage sides are slightly rounded and not slab sided as they should be. These faults together are enough to prevent the ready model from looking like a Mustang. In my opinion these are not minor, nit picking faults. I haven't built the Revell kit yet, I did build a Hasegawa a number of years ago. I'm aware that this may have coloured my impression of the Hasegawa Mustang. The recent issues of Replic and SAMI had reviews of the Revell kit, with colour photos of built models. These photos confirmed my concern about the looks of models completed from the kit. So, I'd rather stay with Hasegawa for my next project. Perhaps Revell offers better value for money, but I am willing to pay the extra for the Hasegawa's better outline accuracy. � Copyright 1997-2006 by IPMS Stockholm and the Community Members. All Rights Reserved. The layout and graphics of this site, HTML and program code are � Copyright 1997-2006 Martin Waligorski. Used by permission.